Infallible Techie: How to Hyperlink a Record in lightning:datatable? 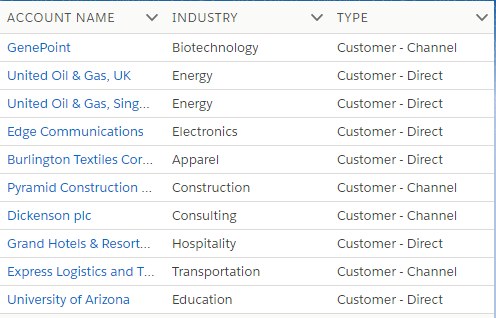 How to Hyperlink a Record in lightning:datatable? Make sure typeAttributes is set. you need to set the Link value and Link label. The post has AccountListHelper.js code. Thank You! for your reply. While using hyper link on Account name, field name you are passing account Id and in type attribues you are passing actual name of account. While sorting clicked it is taking field name as account Id not account name. So sorting functionality is behaving differently. Can you please help me to pass name instead of Id on sorting while we are using hyper link or button on name field. Thank You! For your reply. Its helped great for me. I am appreciating your reply and your dedication, hard work on salesforce. How to avoid reminder popup in Salesforce?